Filming on the final episode of Sherlock Series 3 is officially under way this week and, subsequently, tantalizing bits of new information about the upcoming season have started to surface. With the departure of Andrew Scott’s nefarious Moriarty after the, um, rather dramatic events of the Series 2 finale, everyone’s been waiting to see who Sherlock Holmes’ next great nemesis might turn out to be. There are several intriguing bad guys littered throughout Sir Arthur Conan Doyle’s works who, while not necessarily as well known as Moriarty, would nevertheless be fun to see face off against Sherlock and John. 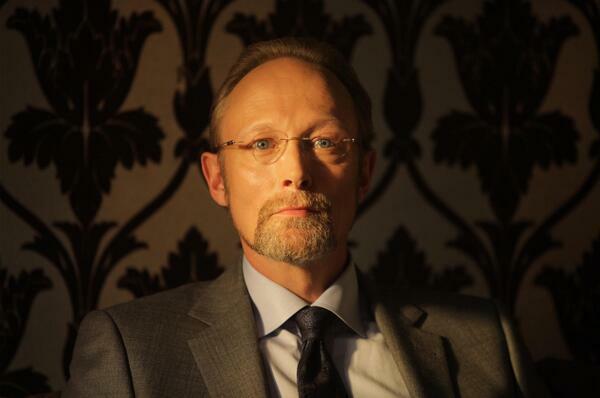 And now we know – Lars Mikkelsen has officially joined the Series 3 cast as new villain Charles Augustus Magnussen. Charles August Magnussen is obviously a play on Charles Augustus Milverton, master blackmailer and generally all-around bad guy from the 1904 Conan Doyle story The Adventure of Charles Augustus Milverton. This isn’t necessarily the most well-known Holmes story in existence, but it’s one of the most fun, involving blackmail, a woman out for revenge, Sherlock and John breaking into someone’s house, and a fake engagement for Sherlock, among other interesting twists. And given the fact that co-creator Steven Moffat is the writer behind the Series 3 finale (which is called His Last Vow), well, clearly anything can happen. While this announcement would appear to confirm that Mikkelsen is appearing only in the Series 3 finale, this news doesn’t meant that references to Magnussen/Milverton won’t pop up throughout Series 3, much as Moriarty mentions did in Series 1. There’s also no guarantee that Magnussen/Milverton will be around for more than just the Series 3 finale, though we can hope, right? Are you excited to see Moffat and Gatiss’ take on Charles Augustus Milverton? Or were you hoping for a different Conan Doyle baddie to pop up?